An experienced warrior and a noble, the paladin was no stranger to battle, and he or she understood that protecting oneself in battle was an important task. That is why no paladin would ever ride into battle without their Paladins Helm. In regards of design, this helmet is quite similar in appearance to the Knights Helmet, and in many ways, a paladin is similar to a knight. The difference between the two comes as a matter of color, as this helmet possesses a rich and regal hue of brown and black that perfectly accents the noble look, without standing out like gleaming metal. 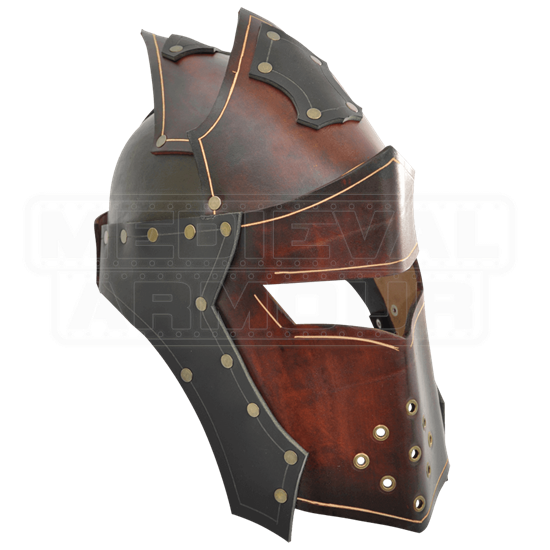 The helmet consists of a protective face-mask made from quality leather that has been colored a rich, almost woody brown color. The face-mask features a diamond-shaped array of breathing holes for proper ventilation, as well as a broad slit to ensure that the wearer can see quite well. The top of the helmet features triangular spokes that are swept back across the helmets top and are adorned with riveted black leather reinforcements near the tips. The sides and back of the helmet are also constructed from black leather. The helmet features a leather strap for keeping the helmet secured to your head, while also allowing for a bit of adjustment on the fit of the helmet. It is available in one color, which perfectly matches our leather Paladins Armor and all its accompaniments. It is sized to fit a 24-25 inch head measurement. 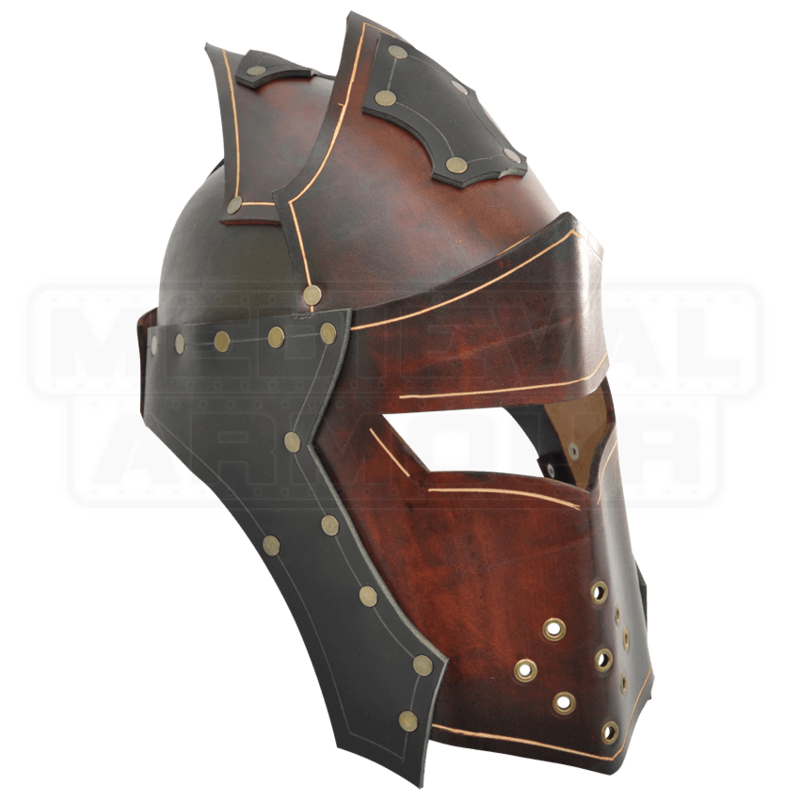 The Paladins Helm is the perfect way to keep your face and head perfectly protected in the hectic maelstrom of LARP combat, all while ensuring that you look as fearsome as you feel.